Here is a picture of a visitor to our little ranch a couple days ago. The tree he/she is sitting in is about a 100 yards away between the house and our livestock pens. While I was outside taking pictures, it was eerily quiet. Our normally noisy roosters were completely silent while that eagle was perched in the tree above them. It was so great to see this bird hang out at our place for a hour or so. In the decade we have lived here, I have watched one eagle fly across the place, but this is the first one that stopped and stayed a while. I don’t know why but it is always a surprise how ‘tall’ they are, Great post! Yes, they are definitely an imposing presence. 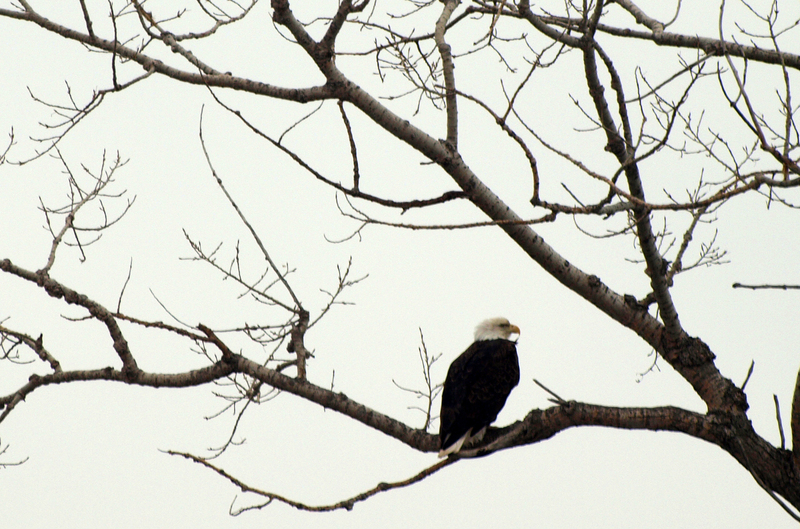 Even the cats stayed hidden while the eagle was perched in our tree. We have a pair that live on the neighbors property and fish the creek that separates the land. The creek does not freeze in the winter as there is a 2 ft. elevation difference between the two lakes and our lake has a spring. We keep binocs on the dining room window sill to watch them when they are fishing/hunting. We really need to get a better camera. I could get some great pics. It would be fun to watch them fish. Sounds like you live in a beautiful area!